Ultra-soft and luxurious plush fabric cover give you silky and soft touch feeling. 4 kneading massage nodes imitates the real massage just like therapy’s hands. Heating provides gentle warmth to sooth tired muscles and relieve aches thoroughly. Thoughtful ergonomic design fits your body perfectly to present you a cozy massage. A magic button satisfies all your demands, easy but workable. Naipo Shiatsu Massage Pillow with Ultra-soft, Luxurious Plush Fabric and Heat Therapy for Back and Neck delivers a circular kneading massage to loosen tight muscles and alleviate pain that gives you an unforgettable massage experience! 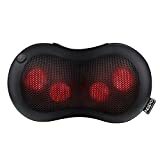 Using the latest technology, this massage pillow is capable of rotating clockwise and counter-clockwise for a deeper, more authentic massage experience. Versatile design of the 3D Shiatsu kneading massage makes it possible to relieve your neck, back or shoulders. As an intelligent instrument, it shuts off automatically after 15 minutes. Whether you are at home or in your car, the portable Back Massage Cushion is your personal masseuse perfect for the person on the go! Don’t wait! Just relax yourself with it to set a perfect mood for full day! 1.Adjustable strap secures the cushion to your favorite chair. 2.Ultimately used in the car, office, and home. A FREE car adapter give you an unlimited massage trip. 3.Ultra-soft and luxurious plush fabric cover has strong permeability which provides you a more comfortable massage. 4.You can return your undamaged product and packaging within 30 days of purchase to receive a full refund for any reason. We’re also offering 24-month warranty for quality-related issues. 1.Please do not use benzene or thinner and other aggressive detergents to clean the product or it may fade. 2.Before you clean, please make sure that the switch is in the off location and the power plug has been pulled out from the socket.